Nestled in the foothills of Scottsdale Mountain, Villa Falcone will sell to the highest bidder regardless of price on May 18th. 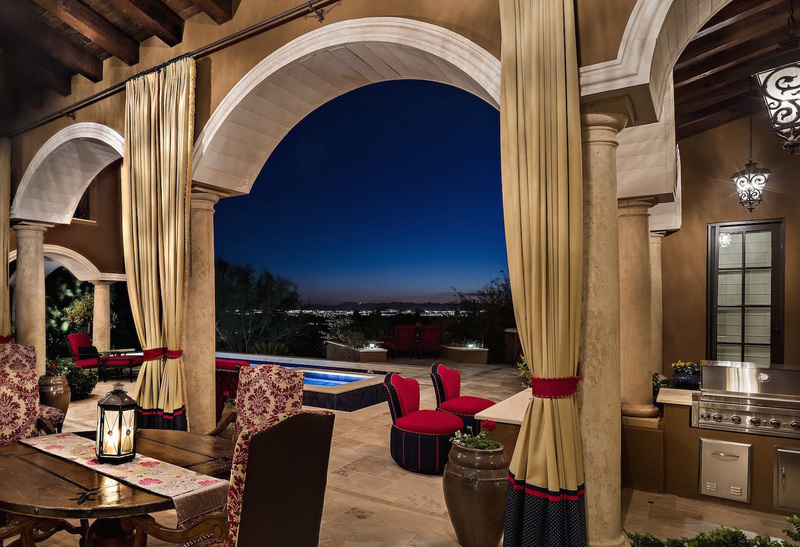 Villa Falcone is a romantic Santa Barbara Tuscan style home perched in the gated community of Shadestone within Scottsdale Mountain. This jewel of the desert will be sold at a luxury no reserve auction on May 18th, 2017 by Supreme Auctions in cooperation with Keller Williams Realty Sonoran Living. Designed over a two-year period, the home was built by Tom LaBlonde Development while the sellers’ supervised construction themselves. Each of the quality materials were meticulously selected, such as the Omni Block for the homes construction. The design elements throughout the home even reflect the sellers’ travels throughout Italy and Spain with authentic materials being imported from as far away as Morocco. The result is a singularly exquisite home that was built to last forever. Villa Falcone features a castle-like great room with natural stone walls, a fluted tortoise-shell chandelier, and a carved limestone mantel and fireplace. Four elegant Juliette balconies overlook the extensive sitting area beneath the soaring tongue and groove wood ceiling with 20-inch hand-hewed beams. French doors lead out to the main patio and pool deck. Two stunning pools offer formal or fun swimming, a jetted spa, a waterslide, a water wall feature, and even a hidden grotto behind a waterfall. 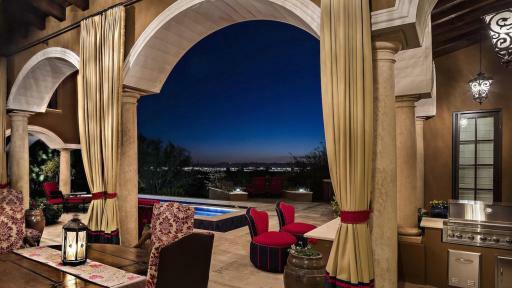 Combined with the swim-up barstools and lush grounds, this oasis in the desert is perfect for entertaining. The homes balconies provide access for residents and guests alike to soak up the sun and the soft breezes while viewing stunning mountain, desert, and city lights views. The spacious master en-suite is its own retreat complete with a sitting area. His and her Onyx vanities and walk-in closets boast custom built-in cabinetry, while a crystal chandelier suspended from a domed ceiling offers elegance for a luxurious soak in the master tub. Guests can enjoy their own separate guest quarters, complete with their own bedroom, bathroom, living room, kitchen, and 2-car garage. Additional rooms in the home include a refined library, home gym, office, as well as a music, family, and game room. Casual and formal dining spaces offer opportunities to enjoy the finest delicacies and conversation, while an observation tower allows residents to feast on 360-degree views. While Villa Falcone enjoys peaceful and tranquil surroundings, just minutes away are highly acclaimed Basis charter schools, nationally recognized premier event venue West World, and the world-renowned Mayo Clinic. Scottsdale Quarter offers shopping and fine dining experiences, while the largest employment region in the Phoenix Metropolitan area boasts Fortune 500 headquarters. Sky Harbor International Airport, Talking Stick Arena, and Chase Field in Phoenix are just 40 minutes away. Villa Falcone will be sold at a luxury no reserve auction on May 18th, 2017. Interested parties are invited to contact Supreme Auctions directly at (866) 929-2243 or visit www.supreme-auctions.com.